Innovative wrong-way countermeasure begins hitting the streets. - PPP, Inc.
LaneAlert 2x™ is now in production. The LaneAlert 2x™ is an innovative marking with directional messaging. Innovative in that it is a pavement marking that displays an inlaid message that can be seen, or not seen, dependent upon the direction the road user is traveling. The primary purpose of its design is to provide a visual warning to motorists who are driving in the wrong direction, resulting in self correction, and more importantly, avoidance of a tragedy. Unlike a conventional bidirectional pavement marking, the message on the LaneAlert 2x™ can be seen clearly by the wrong way driver, but virtually disappears when driving the right way. The LaneAlert 2x™ also reduces the undue distraction and confusion of a motorist traveling in the correct direction. 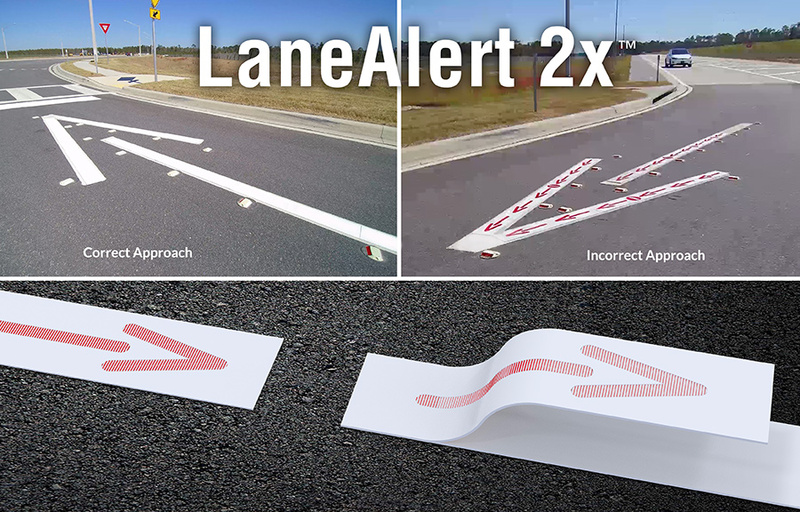 Unlike posted warning signs, the LaneAlert 2x™ is applied directly on the pavement of the travel way, where studies show impaired or distressed motorists focus most. This makes LaneAlert 2x extremely conspicuous and effective. The PPP mantra of developing Safe, Smart, Simple transportation safety solutions is seen in the LaneAlert 2x™. It is safe for the road users, providing a clear, concise message to wrong way motorist without distracting right way motorists. Smart, in that it does so with no mechanical or electrical dependence. And simple, using the familiar installation practices of widely used preformed thermoplastic. Most importantly, is the affordability. Most existing countermeasures come with a significant price tag, especially if implemented across the primary system. With the LaneAlert 2x an agency can spend as little as $500, the cost of an average messaged stop bar, and improve the safety of their roadway. With the LaneAlert 2x™ introduction at the American Traffic Safety Services Association, Intertraffic show in Amsterdam, American Public Works Association and the International Road Federation expositions last year, there are literally hundreds of agencies around the world awaiting its production release. 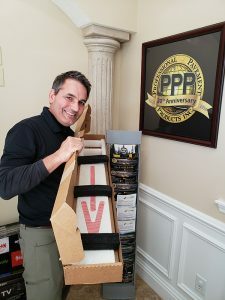 To proof out the effectiveness of this countermeasure, PPP will initially be working closely with agencies both in the US and around the world with pilot projects and studies. “These are exciting times for us, and we are blessed to be the providers of such a wonderful solution”, states Driskell. The other night my wife and I left a family event late at night. I was unfamiliar with the area and when I pulled out of the subdivision, Debbie screamed “No!”. It was then that I realized that I have inadvertently turned in to oncoming traffic! It was a dark intersection of a divided highway. I abruptly turned the steering wheel and ended up in the median itself to avoid any type of collision. Wow, how ironic would that be? The inventor of this incredible wrong-way device dies in wrong-way accident. Strangely I am thankful for this near-miss. It reminds me that this can happen to anyone, anywhere!